Ho ho ho! By now, your stockings will have been stuffed, your tree is folded in the corner of your laundry room (where it will languish until April, when you finally decide to stash it in the shed) and your waistband is feeling uncomfortably tight after that third helping of sweets on Christmas day. Now Christmas is a mere memory, leaving nothing behind but some party food remnants, boxes of decorations and a feeling of quiet exhaustion. Oh, and some lovely presents. I was completely spoilt this year. I received so many gorgeous gifts that I feel a bit greedy when I rattle them off. In the last week, each time I’ve been asked ‘What did you get for Christmas?” I’ve had to choose just one item from an astronomical list of gifts so as not to seem like a spoilt brat. However, knowing how much you all love a good haul post, I can happily share my Christmas spoils without fear of you likening me to Veruca Salt. To be perfectly fair, I actually asked for very little this Christmas. I really only wanted a couple of new books and a tripod for my camera. I was so very surprised to rip into this great wad of pressies on Christmas morning. I had asked for a lot of books, but I never expected this gargantuan pile of new reading material. It’s so large I had to photograph it in two lots! Ross spoilt me by getting me a bunch of graphic novels. I’ve been really getting into some Oz graphic novels lately, so I was thrilled to open this copy of The Royal Historian of Oz by Tommy Kovac and Andy Hirsch. I’m a massive Nirvana fan, and I wasn’t even aware that there was a Kurt Cobain-inspired comic book. Ross got me this copy of Godspeed by Barnaby Legg, Jim McCarthy and Flameboy. I also got two graphic novels starring my favourite post-apocalyptic potty-mouth: Tank Girl. 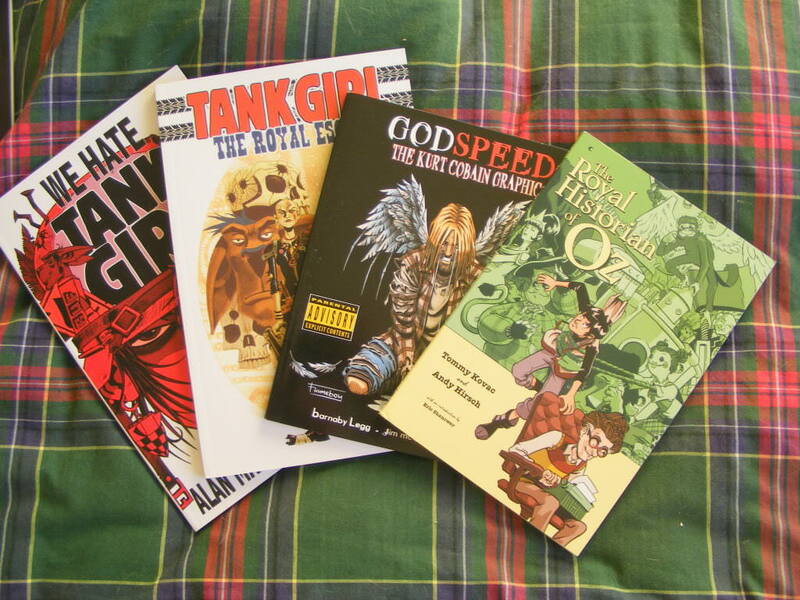 The books I unwrapped were Tank Girl: The Royal Escape and We Hate Tank Girl. There were still more books in my Christmas stocking. My good mate Adam got me a book by Lucy Siegle called To Die For: Is Fashion Wearing Out the World? It looks mighty interesting. Ross’s sister shares my love of films, so she got me this book of Great Movie Moments by John Russell Taylor. Despite the fact that Cabaret, one of my favourite films, is featured on the cover of the book, it doesn’t actually get a mention. My brother got me a copy of Snuff, which is rumoured to be Terry Pratchett’s final Discworld book. 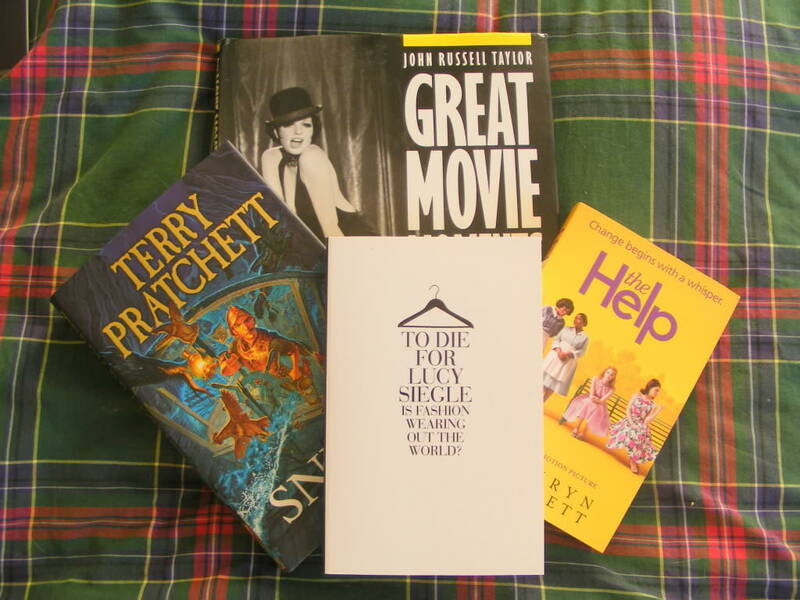 My parents got me The Help by Kathry Stockett, which I am gagging to read. 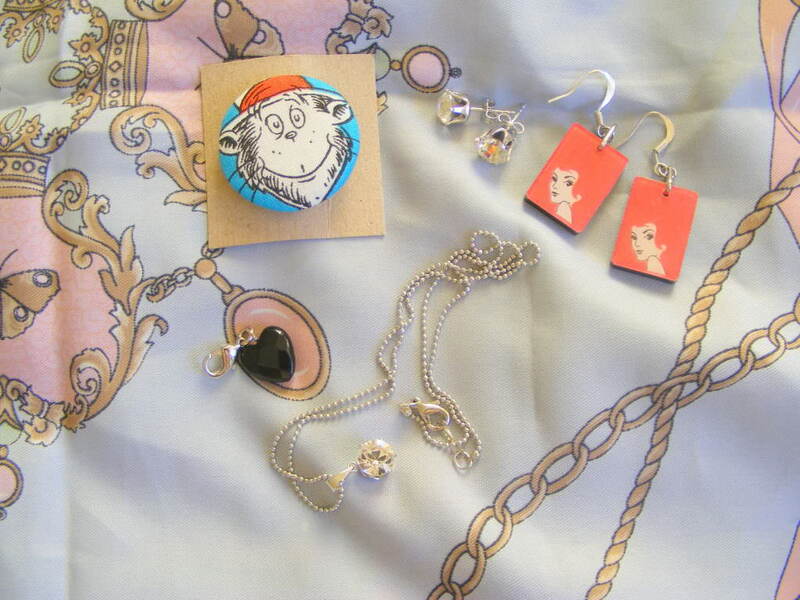 I received some lovely jewellery. My parents bought me a pair of Swarovski crystal stud earrings and a matching pendant. They also got me a black heart-shaped charm. Sam, my lovely housemate surprised me with these amazing Red Head matchbox earrings. I’ve worn them at least six times already since Christmas and ever time I get about a million compliments. She also bought me a Cat in the Hat button. The background in this picture is a silk scarf gifted to me by Ross’s sister and her boyfriend. I can’t express how gorgeous it is. 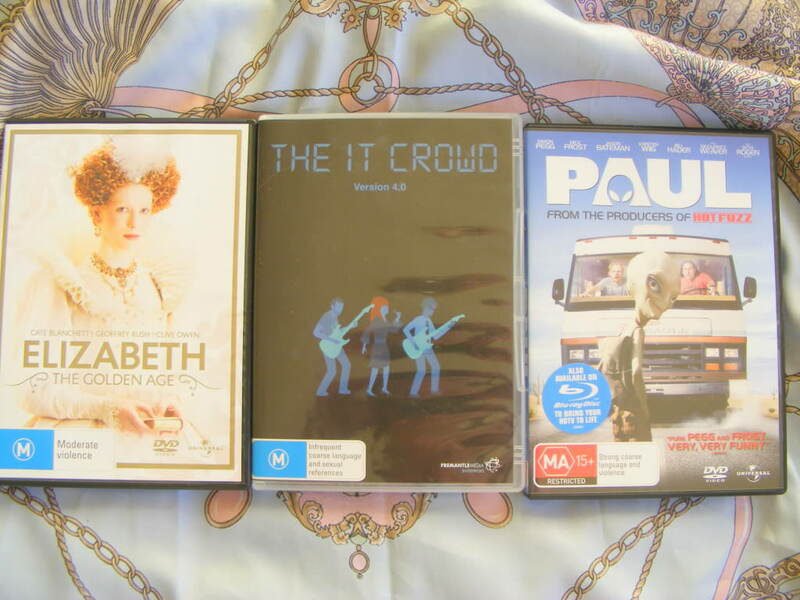 I got a couple of DVDs, including Season 4 of the I.T Crowd, Paul and Elizabeth: The Golden Age. All of these came from my parents. Probably the most special gift of all was a pair of concert tickets from Ross. 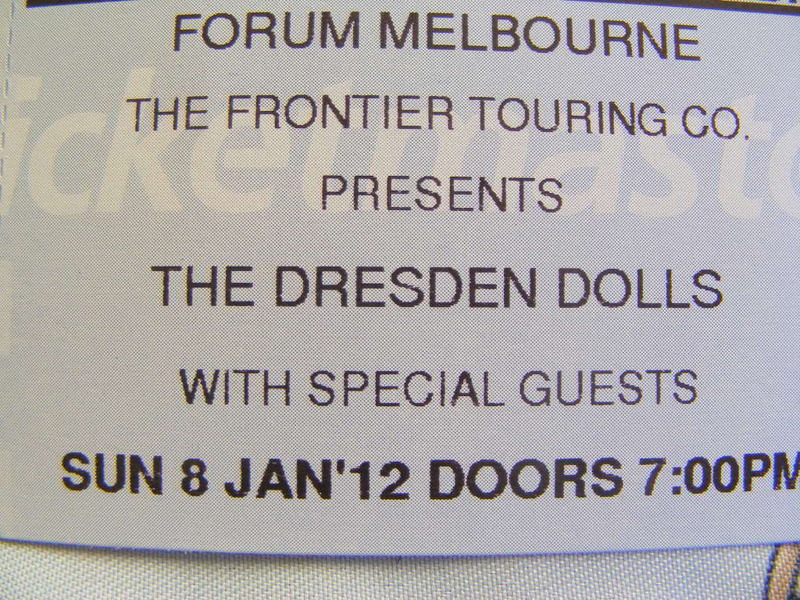 Next weekend we are going to go and see The Dresden Dolls! I am incredibly excited. This will be my first real concert, and I adore Amanda Palmer. It’s going to be amazing.  I got loads of other lovely gifts, including a voucher for a beauty salon, a tripod for my camera, a Japanese tea set, a cake stand, a beautiful kaftan and blazer (which I will post proper pictures of me wearing. I took photos of them laid out on the bed and they just didn’t do them justice). I also got a mountain of chocolate and some lovely bits and pieces for our new house. All in all, it was a very wonderful Christmas. I am so grateful to have such thoughtful and generous friends and family. Previous Daily outfit: hey 2012, let’s be friends!